Consumers have more open business communication channels than ever before. Between website chats, emails and contact forms, actually calling a company almost feels old-fashioned. Is there credibility to the death of over the phone customer service? Do you know what communication channel your customers truly prefer? Here’s something to consider before you disconnect your phone lines. According to a recent study conducted by Five9 and Zogby Analytics, phone-based customer service isn’t going away anytime soon. In fact, it’s still the preferred service channel by the majority of consumers. Let’s look at the results to see how you should be prioritizing your customer service efforts. Survey respondents agree that customer satisfaction is directly tied to customer retention and overall revenue growth. The survey backed up this notion with 90% of business respondents ranking customer satisfaction in customer service as very important. In fact, 96% of consumers said a positive customer service experience factors into whether they will make a purchase with the company. While customers appreciate excellent customer service, most expect more, with 81% saying they have high expectations regarding how quickly customer service is provided. With the internet, consumers have endless options for who they give their business to, and they are quick to find another option when expectations aren’t met. The survey results make it clear that consumers have high expectations when it comes to customer service. One missed chat or phone call can sway them into look elsewhere. Less than 20% of respondents said they’d do business with a company that provided a negative customer service experience. Despite the fact that many outlets proclaim that millennials hate speaking on the phone, the survey found that 54% of consumers prefer to interact with a company over the phone when they need customer service (including millennials). The survey findings clash with the narrative that digital channels are replacing the phone. The reality is digital channels, like web chat, are simply bringing more communication options to the table for consumers. The preference for direct interaction over the phone is backed up by the fact almost two-thirds of respondents expect to resolve their customer service issues in 15 minutes or less, which is more likely to be accomplished on a quick phone call rather than over an email chain. As the phone is the most critical tool aiding customer service, it is essential that you have a phone system that is well-designed and the right fit for your specific business. If a customer calls in and they have trouble hearing your customer service agent, it will only take a few seconds to lose that customer. Do you use a landline now? That might be limiting your availability to take customer service calls while you or your employees are away from your desk. Use VoIP? It’s important to ensure high sound quality so that those calling in don’t get frustrated. 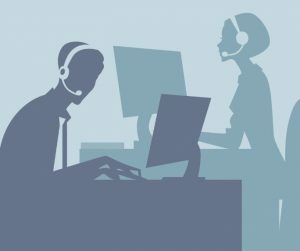 There are several factors to consider when it comes to your phone system setup to ensure you’re delivering the high-quality customer service consumers expect. If you’re not sure where to start, fill out this assessment form, and we’ll help you find solutions for your specific situation.